Three generations of mile markers are seen here. 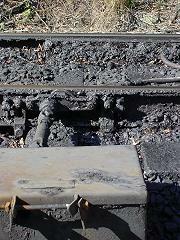 The oldest is the rusting piece of rail on the right with the fading "26" painted on. 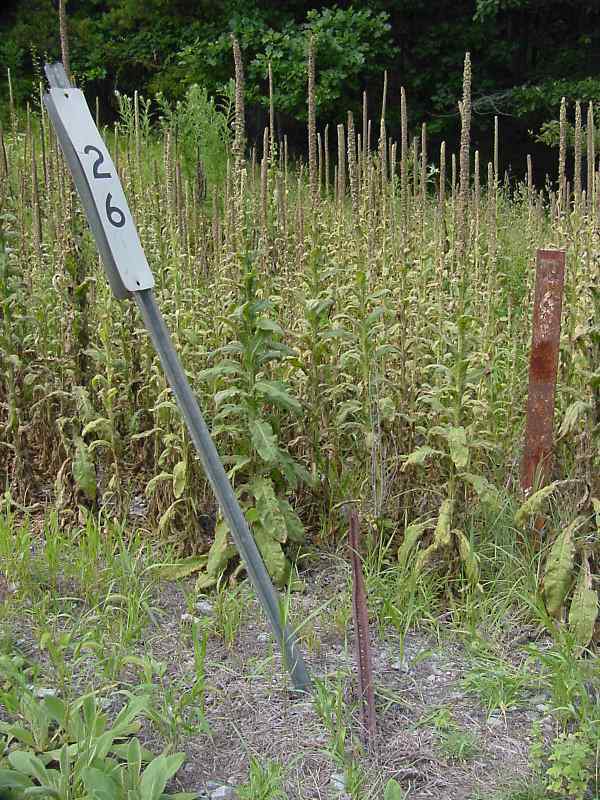 In the middle is a rusty, but newer signpost. On the left, despite being the newest, the current marker is already tired and leaning. This is typical summer scenery along the OML. 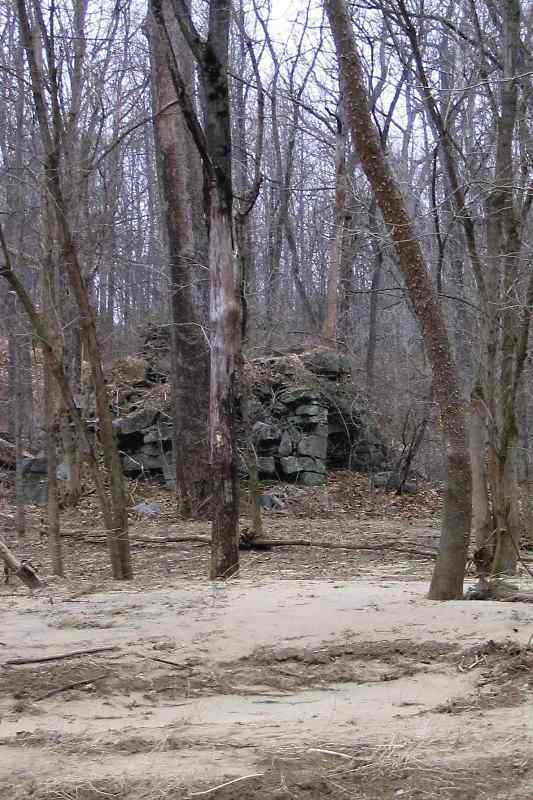 This remote area of Patapsco State Park requires a long hike to reach. It's quiet and undisturbed here. The CPL signals in the distance are dark; since this photo was snapped, CSX has replaced all the CPL signals along the OML. 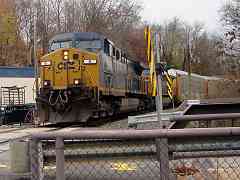 "Most CSX signals along the OML and other lines are approach lighted. This means that the signal is dark till a train enters the block on either side of it. If the train is approaching from the front side of the signal it will light and give the Engineer his signal. If a train is approaching from behind the signal it will light red. Once the trains clear the block in front of the signal, it will go dark again till needed. "There are some signals along the OML that are always lit. The ones that come to mind are at Woodstock, Rt 97 and Morgan Station Road. There may be others but these are the ones I know of. 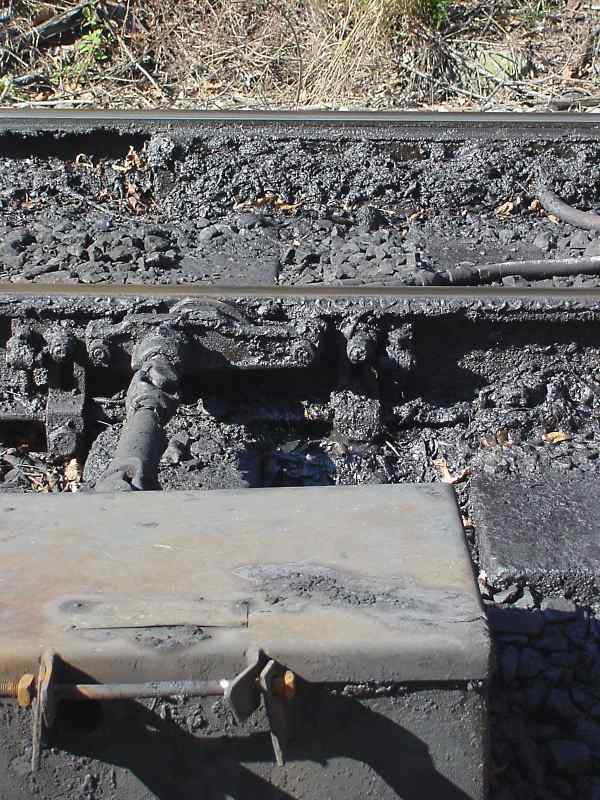 The ones I mentioned protect sidings so that may be why they are always lit." 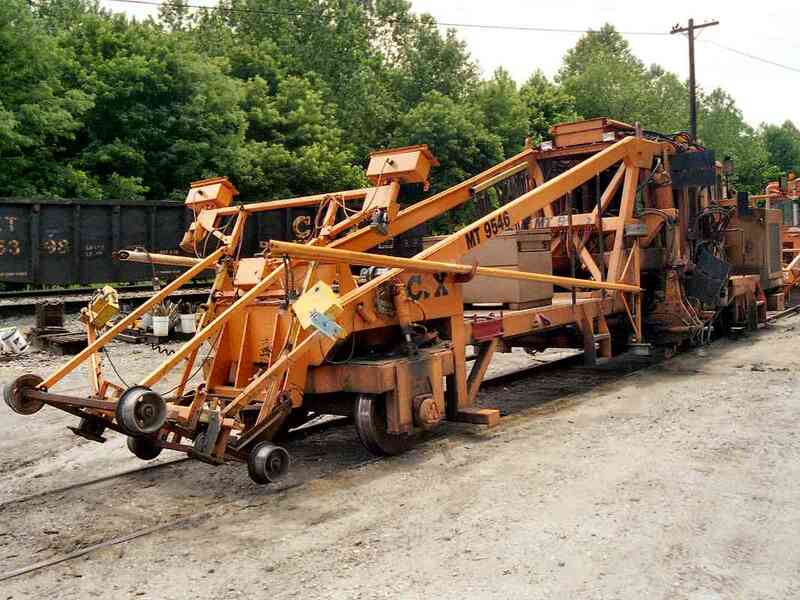 Another stone stringer (the OML's first track base) basks in the sun alongside the tracks. This one has an odd set of iron strap rivet holes: note how they are paired. I surmise the first set of holes was drilled incorrectly, then the stone turned a bit and a new set drilled. This one is a large (a person can easily walk under it), oddly constructed amalgam of stone, rails, I-beams and concrete, unlike any other I've seen along the OML. It looks like it might have been an arched stone bridge at one time, but hastily (sloppily) reconstructed circa 1900 after a washout. It might also have been a Loree-era realignment project, but the nearby brush was too overgrown for me to find an older alignment. Also note the decorative finials atop both signal posts. 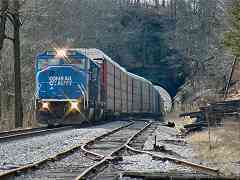 Like all the OML's CPLs, since the time of this photo CSX has replaced these with its newer signal design. Bridge 27 is a small, unphotogenic thing, but it does have the always-helpful painted-on number. This view looks back east as the winding OML bends around yet another hill. Access to this spot is via Gorsuch Switch Road. 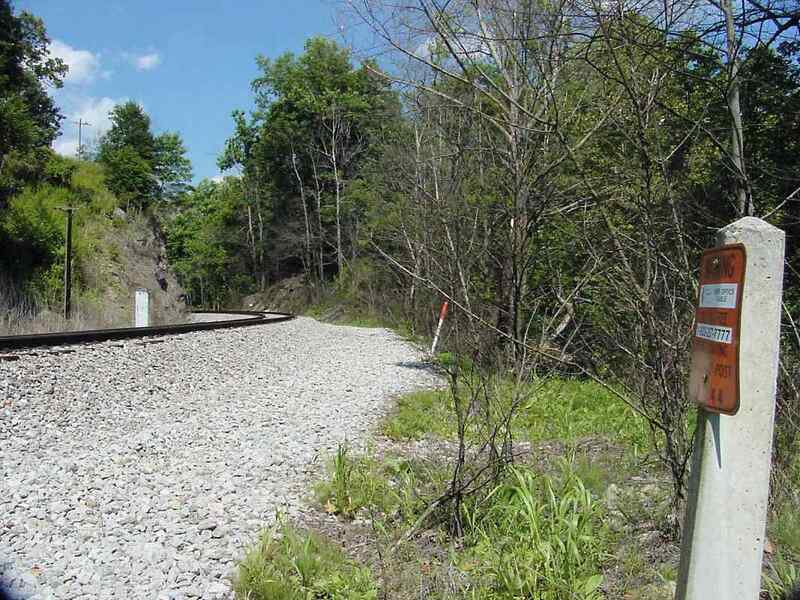 The road ends about a half mile from the tracks, but there is a rocky hiking path that leads you right to the orange and white cable marker seen here in the upper left. 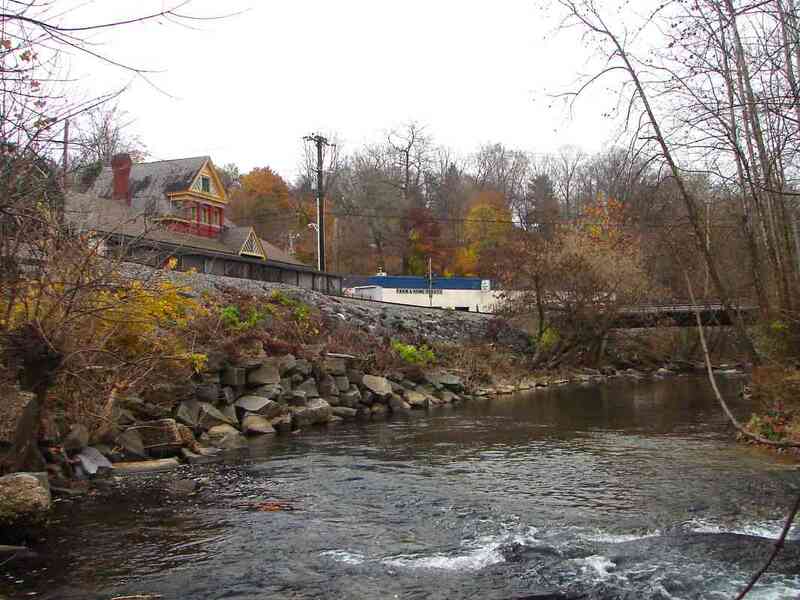 Until the 1940s, Gorsuch Switch Road had spanned the Patapsco River via a bridge. "You have taken me on your tour, now let me take you on one. 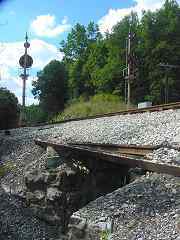 "Route 32 runs through Howard County across the South Branch of the Patapsco towards Westminster in Carroll County. 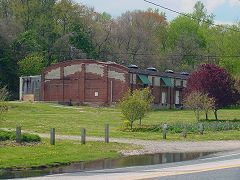 For your tour go south through Sykesville, past the Railroad Station, now Baldwin's Restaurant, cross the R.R.and bridge over the river. Take the next left (east), River Road. It follows the river closely, crosses a small stream, goes by what used to be a mining villlage Elba, with the Elba Furnace showing through the trees across the river. Gradually River Road veers away from the river, over several hills, and just as it turns sharpley to the south, to intersect Route 32 (again), you find a restored home with a sign in front: 'Solopia'. It sits on the northwest corner of what used to be a 335 acre farm. We always spelled it 'Solopha' even though the 1741 Land Grant patented by John Johnson, a recent arrival from county Salop in England, shows the spelling to be 'Salopia'. My ancestors bought the property in 1832. At this corner you intercept, to the left, Gorsuch Switch Road, once county-owned and maintained, now hardly a pathway down hill through woods and brush. 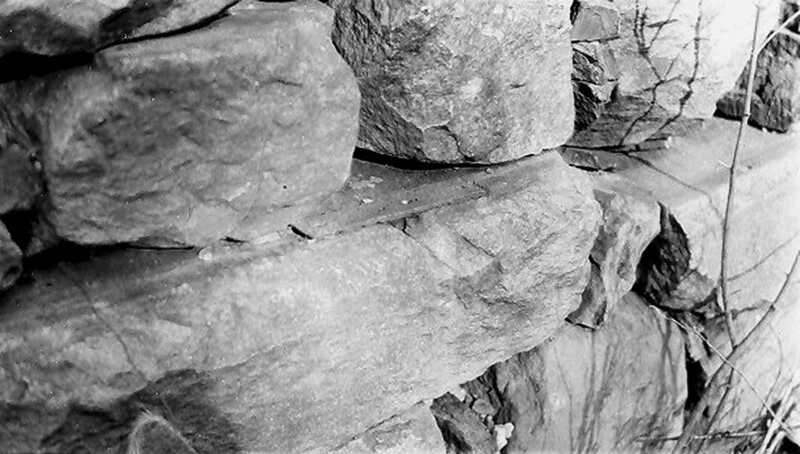 After about a mile down hill, you cross a stream and then you come to what was once a bridge, but now large-stoned abutments on either side of the river. (Pause there, and envision us swimming and wading in the shallow water on summer days, or, in the winter, cuttting ice from the river, hauling it away with a four-horse team, back up the hill to the ice house near the main house. There, covered with straw, the ice lasted through the summer, cooling many a glass of iced-tea). 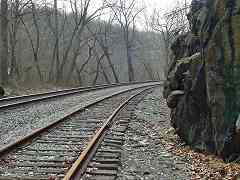 "Now walk towards the railroad. On the left was a barn-red station for waiting passengers, and a sign 'Gorsuch'. On the right, was a barn-red milk stand, at a height level with the on-coming refrigerated B&O car door. Imagine a one-horse milk wagon, at 7:15 AM, unloading 5 and 7 gallon milk cans onto the stand and then sliding the cans aboard. (Once they picked me up, slid me aboard, the engineer released his brakes so as to drift slowly away, just to scare me). None of the buildings probably exist today. You notice that there are then two tracks, and (what we called) a 'spare' where sometimes box cars were parked. The west bound 'half-past two' train brought afternoon visitors to Solopha from Ellicott City and sometimes a fiddler or two from Baltimore to enliven gay-nineties evening dancing in the Solopha parlor and living room. Sometimes train tracks had to be replaced. A burley crew, led by the rhythmic chant of the crew-chief, and the echoing reply of the crew, lifted and replaced the heavy track, all lifting in unison with with the beat of the chant." Gorsuch was probably named for a nearby landowner. 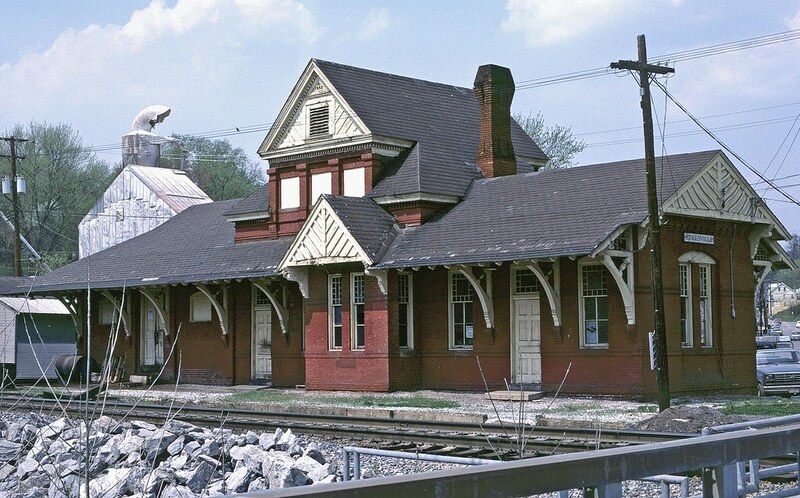 In the past, it was a B&O stop with a short siding. The station was located between the tracks and the river (left side in this photo). 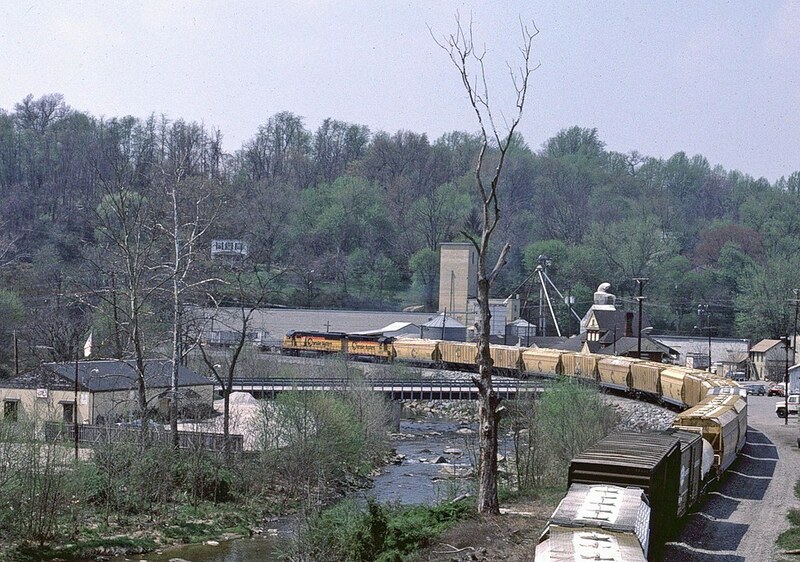 "I forget whether I had mentioned this earlier, but a couple of months ago I got involved in trying to track down the B&O's so-called Patapsco & Susquehanna branch. This was a projected cutoff line around Baltimore which left the OML between Sykesville and Gorsuch and ran roughly NE, vaguely following the course of Old Court Rd. and a portion of I-695, and joining the Philadelphia line at Van Bibber, MD (west of Edgewood). The line apparently was one of those Loree projects that never got anywhere, and, although some property apparently was acquired, little or no actual work was done on it. "The idea was to bypass the congestion around the Baltimore terminal (especially the Howard St. tunnel) and reduce mileage for OML freight traffic going to/from points north of Baltimore. There also may have been vague plans to join this with the Washington branch. From what I've been told, some grading work was started at Gorsuch, but obviously not much was ever done with the plan. "And about the time of WWI the PRR had a plan to use this route jointly with the B&O. 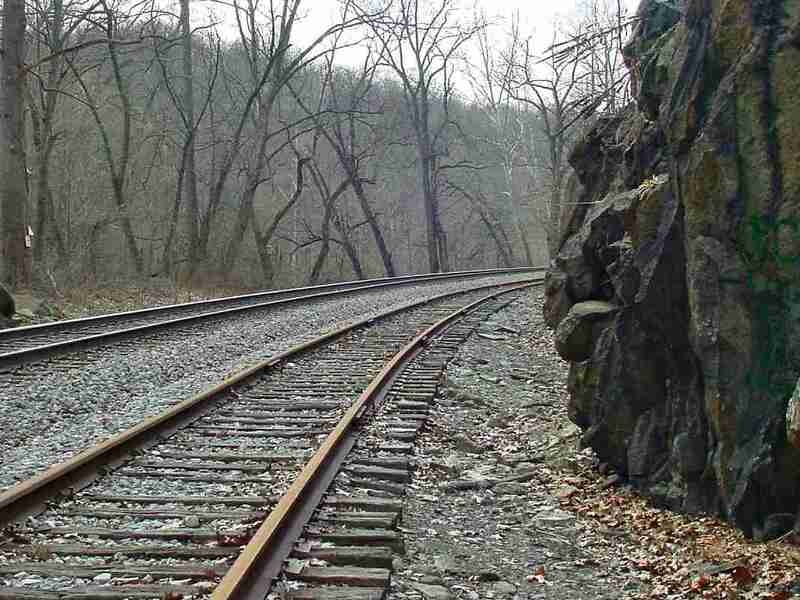 The PRR line (going from south to north) would leave its Washington line near Landover, swing NW north of Laurel, and follow the Little Patuxent north to meet the 'new' B&O cutoff line at Granite." "My mother also told me that years ago at Gorsuch Switch, the trains would come up from Baltimore and then change tracks, or get off the tracks to let another engine pass on the main line, etc. (I'm not sure). I don't think there is much left there now, but there is a road called Gorsuch Switch road. It is right off of Raincliffe Road, past Slacks road if you are going east. The 'switch' was in that hollow near the river." 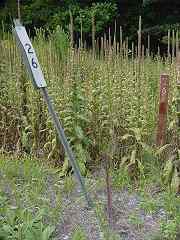 Near the Freedom Water Treatment Plant east of Sykesville is where you'll find the only OML bridge with a fractional number: 27 1/16. This is very odd. The closeness of the number to the distance from Baltimore makes me suspicious. But, the numbers painted on other OML bridges are indeed consecutive, not mileage based. 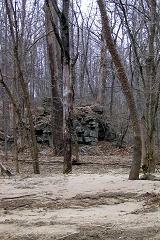 Hillside cuts, even small ones like this, are surprisingly rare along the OML. 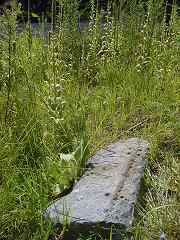 Here the hill dips sharply into the Patapsco River, so there was no room to go around, and no reason enough to build a tunnel. This one was informally named Long Girls' Cut. 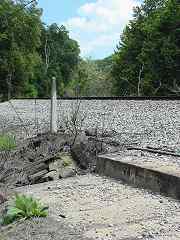 Just beyond this cut, on August 25, 1940 a derailment tumbled B&O engine 4449 into the river and killed three of the crew. A picture of the engine is on page 120 of Joetta Cramm's book Howard County: A Pictorial History. Eastbound trains are about to enter a winding section of the OML so this is a good place for an automatic grease applicator. It will put some grease on the wheels to reduce friction and wear as trains negotiate the upcoming curves. To reduce the cost of supplying electricity to this relatively remote area, the applicator instead employs the mechanical action of wheels passing over an actuator attached to the rails to pump out some grease. From the appearance, I'd say it's working. Subsequently this unit has been upgraded to a solar powered one. 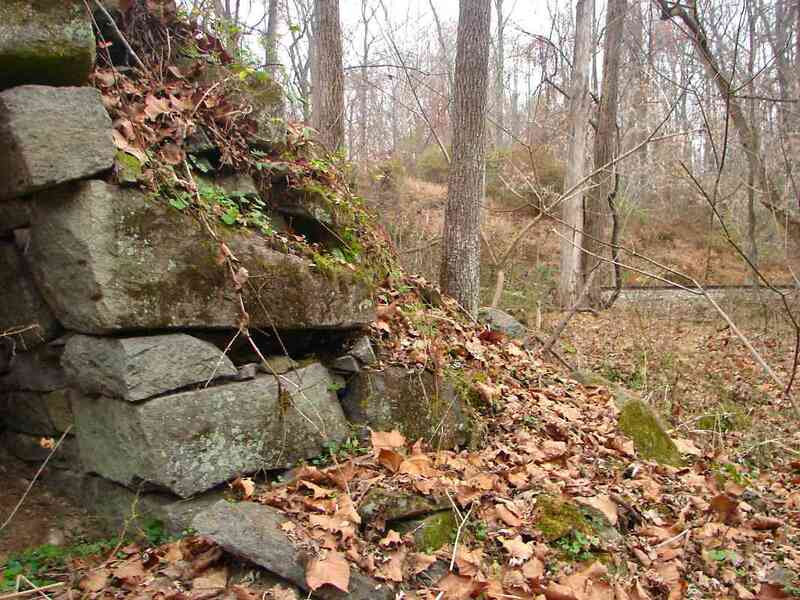 "My wife and I discovered the remains of the Elba Iron Furnace next to the OML just east of Sykesville. We though you might be interested if you weren't already aware of its presence. We noticed at least one stone stringer near the very top of the furnace. "Attached is a photo taken today, January 17th. The photo was taken from the south bank of the Patapsco (along River Road) - I was facing north when I took the photo. The furnace is on the opposite bank. Feel free to use the photo on your site if you wish. "Thanks again for authoring such a great web site. We enjoy following your frequent adventures along the OML." 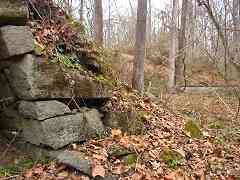 Further research indicates Elba Furnace remained active until damaged beyond repair by the flood of 1868. Wonderful find and contribution. Thanks, Steve. 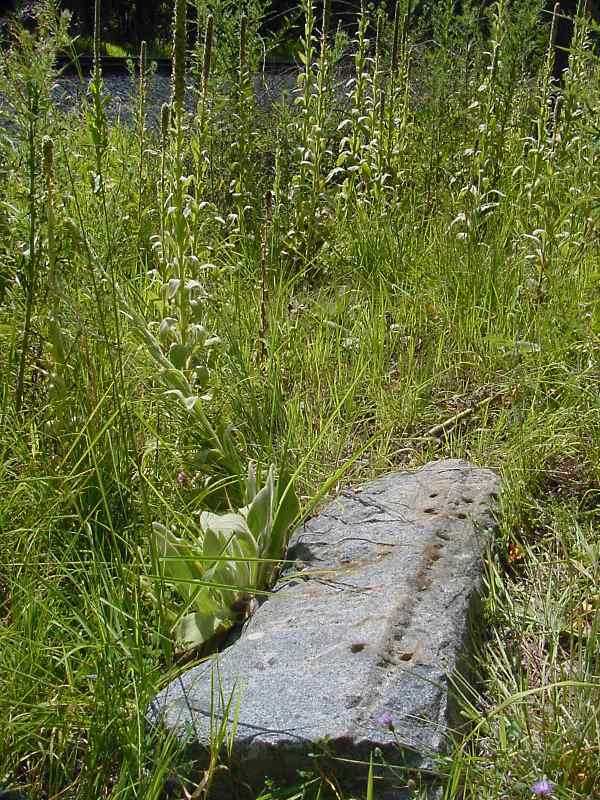 In addition to a stone track stringer, attached to one of these stones long ago was a strap rail joint plate (~1960 photo at left courtesy Herb Harwood collection). More recently I could find neither. 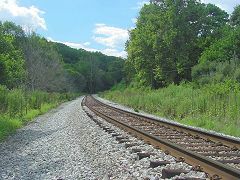 The Old Main Line appears in the background. 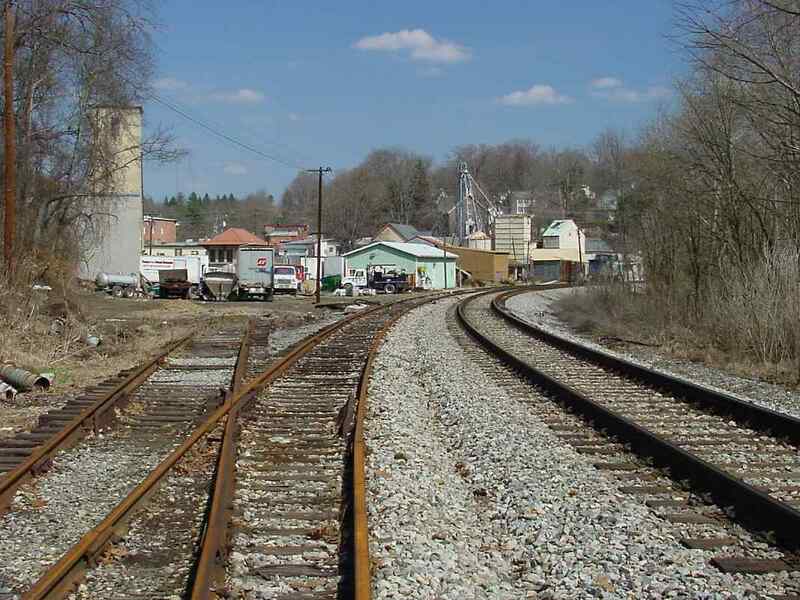 After a few more bends in the track, we approach Sykesville, and its beautiful 19th century station ahead on the left. 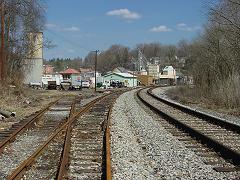 Before the station was built, the OML's original route carried trains further to the right, in fact, to the right of the purple building in the distance. 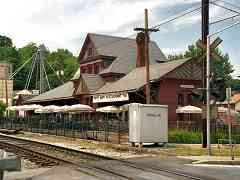 Sykesville is home to the only surviving Baldwin-designed railroad station exclusively on the OML (there's another at Point of Rocks that is shared with the Metropolitan Branch). The building dates from 1883, and now houses a restaurant. 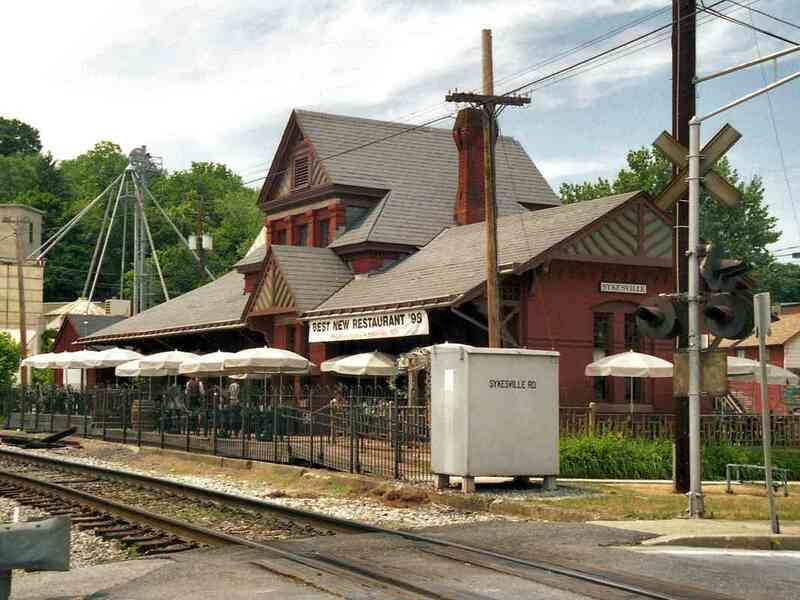 During the warm months, you can enjoy a meal under the patio umbrellas and, if you're lucky, watch some CSX traffic. 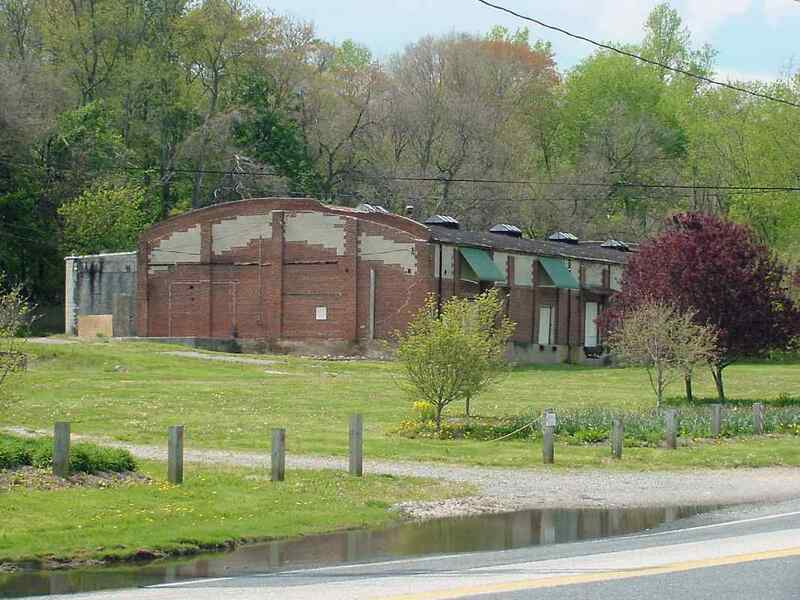 "If you're referring to the brick building with the curved roof, that is an old Apple Butter factory. It never had a rail connection although there is a railroad looking water tower behind it. That was water for the factory. The small wooden building next to the road was the scale shack for weighing trucks. Surprisingly enough there were other buildings there that did not survive the floods but that one did. 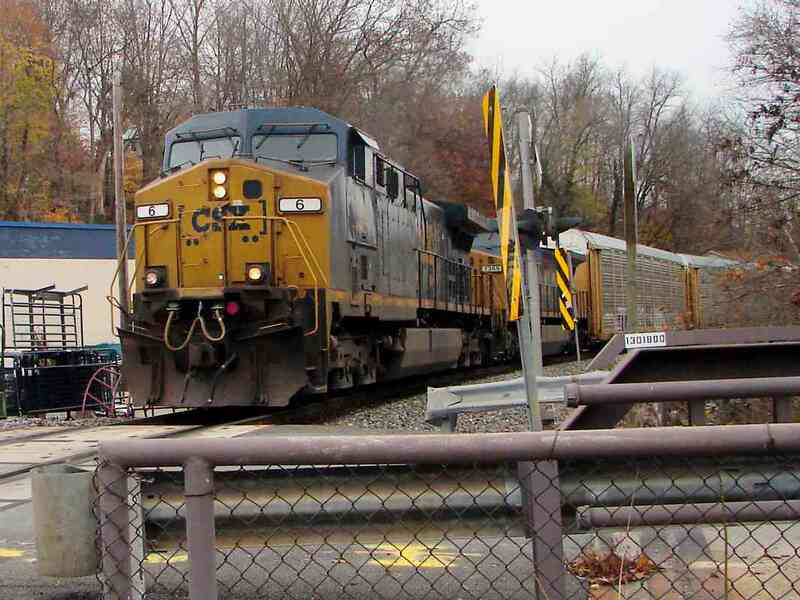 A rail connection would have required a bridge over the river, something that was just not economically feasible for the amount of traffic the factory might have provided." CSX 6 and CSX 7369 tow autoracks across Main Street for the fun of it. At the time this was the lowest numbered unit I had seen, but since then I have also seen CSX 1 which is named the Spirit of West Virginia. 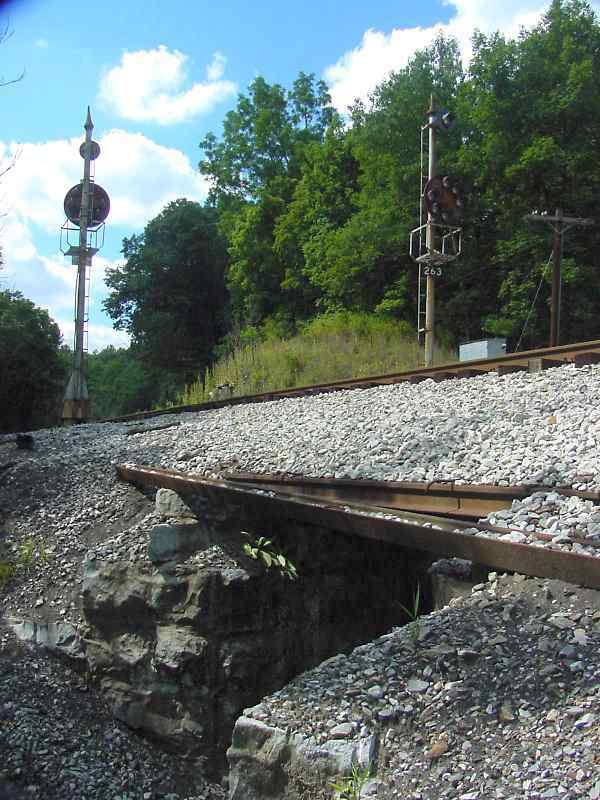 The siding just west of Sykesville station sometimes hosts assorted CSX Maintenance of Way equipment, such as that seen here. I'm told this is a track leveller. 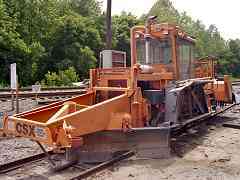 It measures the height of the track and then raises or lowers it as needed. 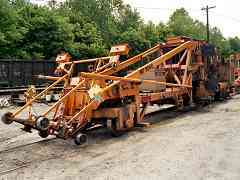 "Sorry-but there is NO such machine as a 'ballast leveler' as you show in 1 of your photos. 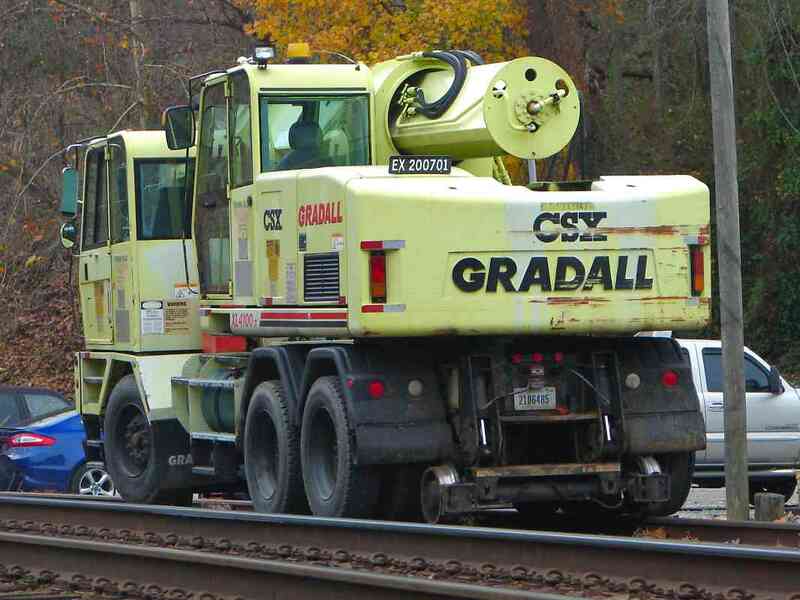 The machine you show parked on the Sykesville siding is a 6700 Tamper. It 'surfaces' the track. The machine behind it is a ballast regulator. 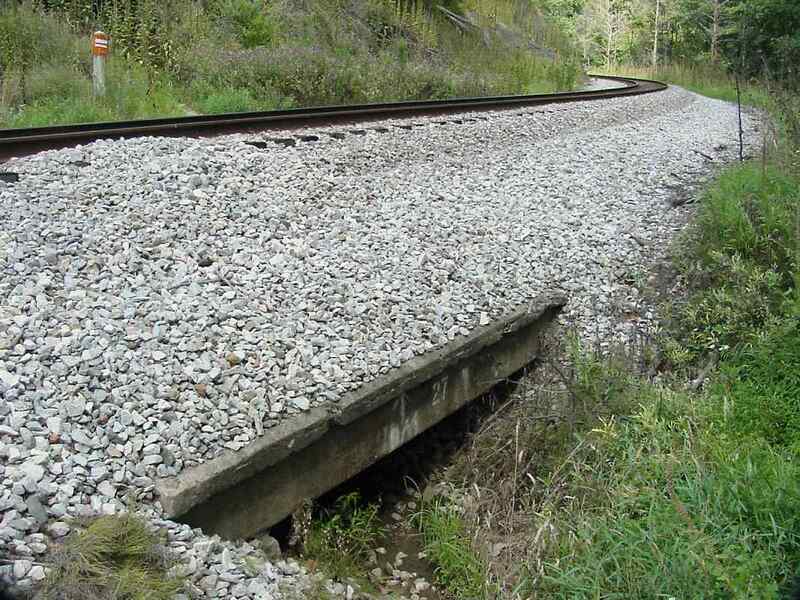 It moves the stone around to the low spots so the tamper can raise and line the track. Parked behind is the ballast regulator. These machines operate as a team, and make quite a racket when they do. 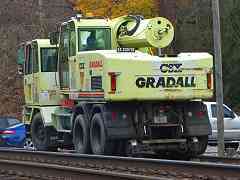 Many years later you would have found a Gradall model XL 4100 Boom that CSX has numbered EX200701. Mixed in with these erosion control stones are a few track stringers. The culvert barely seen at left is now fed by drains in the parking lot next to the station; previously, toilets of nearby buildings had emptied directly into the stream. Here is the view looking back toward Sykesville as we continue our westbound tour. The original route joins with the old, infrequently used siding that parallels the present day track. 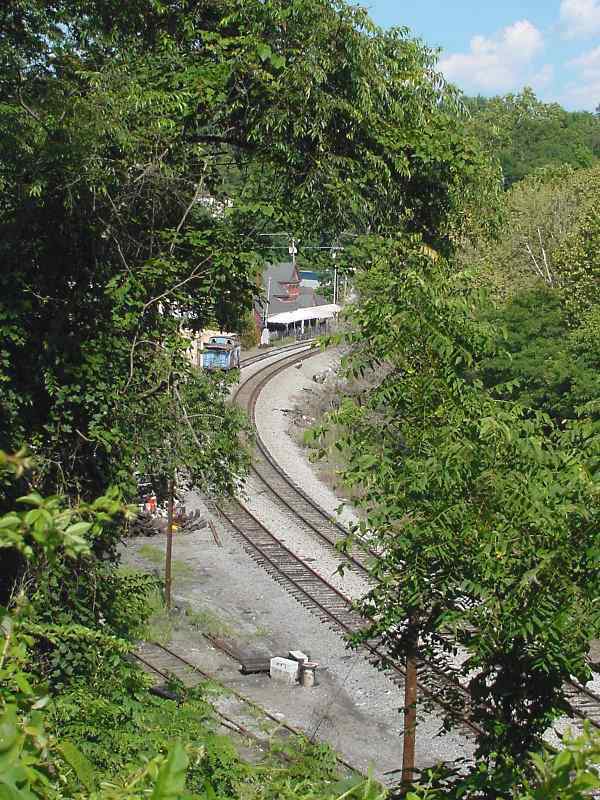 For reference, the B&P tower can be seen in the distance at right center, and Sykesville Station is obscured by trees on the right. This is another view looking back east from a hill along Oklahoma Avenue. 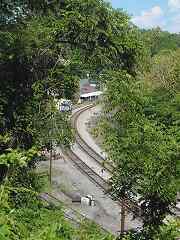 Sykesville Station plus a rusting, blue caboose on the siding can be seen through the trees. 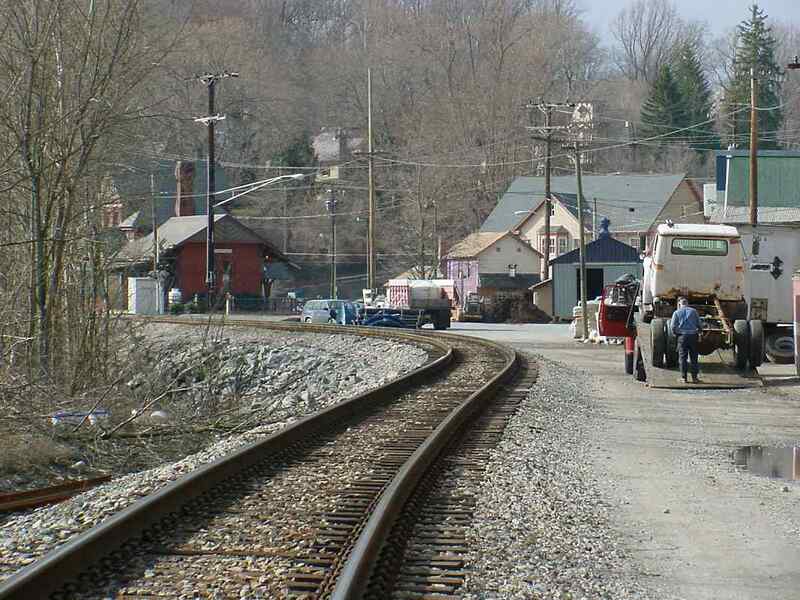 Before it was named Sykesville, the B&O called this location "Horse Train Stop" presumably because the horses that pulled the trains along the OML in pre-steam engine era were changed here. William Patterson, one of the early directors of the B&O, owned several thousand acres of land in this vicinity. He named his estate Springfield and made it his country home. 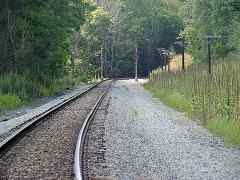 West of Sykesville, the OML re-enters rural terrain. 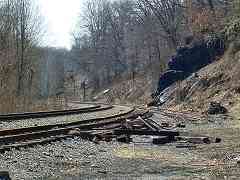 Just west of town, I was surprised by the lack of clearance between the rock face and the siding tracks. As I learned later, and as you will see on the next tour page, there's a reason for the tight squeeze. 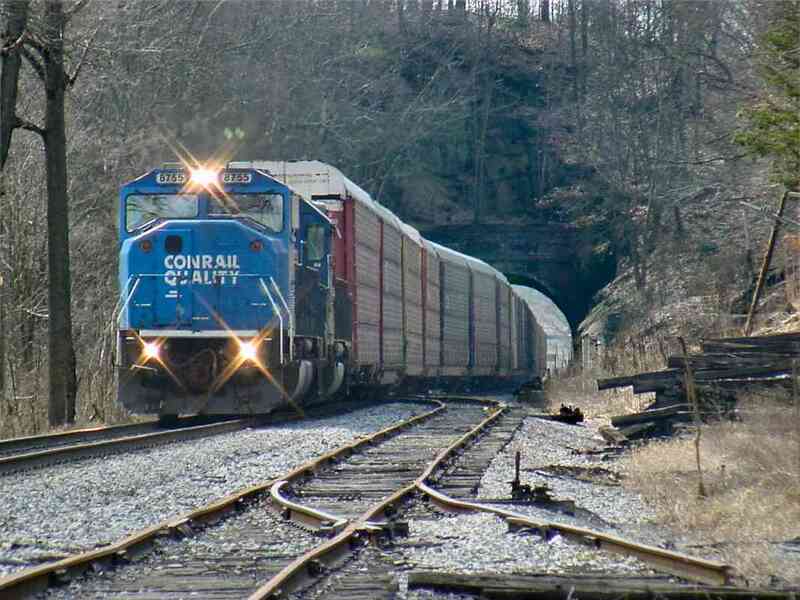 Around the bend from the tight squeeze, colorful auto racks do their best to imitate a roll of Life Saver candies as they follow Conrail 8755 eastbound through the Sykesville Tunnel. The engine, the last manufactured of the SD60M series, has passed the siding switch, and is about to pull adjacent to the disused switch for the Springfield Hospital Spur. That spur is the subject of the next page of the tour.